Serve this elegant appetizer of brie baked in pastry with toasted slices of baguette or fruit chutney. Remove pie crust from refrigerator; let sit at room temperature for at least 20 minutes before removing from wrapper. In a small bowl, mix together walnuts, 1 1/2 tablespoon butter, rosemary and cayenne; set aside. Unfold pastry dough on a greased baking sheet; spoon walnut mixture in center of crust and spread into a 5-inch circle. 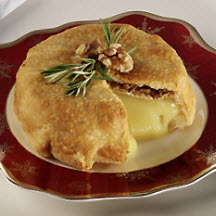 Place Brie in center of pastry on top of walnut mixture. Fold dough over Brie, starting at two opposite sides, bring to center and pinch to seal. Then, fold in remaining pastry ends, crimping as necessary, to center and press to seal pastry ends. Invert Brie on baking sheet and brush top with remaining melted butter. Bake in a preheated oven at 400°F (205°C) for 20 to 25 minutes or until pastry is browned. Serve with toasted slices of baguette and fruit chutney.